Jamaica, VA – After a great field of FASTRAK late models showed up for the exclusive Friday race an outstanding 71 cars qualified for Saturday’s festivities. Ross Bailes set the overall fastest time with a 18.449 second lap around the half mile track after going out last in the first of eight groups. The top-2 drivers in every heat moved on to the feature race with out much challenge to their positions, but a few did trade first and second place. In the b-mains it wasn’t as easy for the front row though with at least 13 cars slated to start in all four races and only the top-2 advancing. In the first B-main Joshua Bishop was able to hold on to his first place position but Ron Parker wasn’t so lucky with his second place spot. Dale Hollidge battled from sixth place riding the cushion to grab a transfer spot into the feature and was able to challenge for the win in the closing laps. The second B-main saw the same two positions move on. Brett Hamm ran strong up front while Travis Pennington moved up from sixth place to transfer to the main. For the third 12 lap race Caryl Charlier and Lee Cooper moved on to the feature while this year’s USA 100 winner Benji Hicks failed to gain enough ground to continue his night. In the final B-main last year’s World Champion Dennis “Rambo” Franklin rolled off ninth after struggling to find speed through qualifying and his heat race. Virginia Motor Speedway regular Tyler Bare came up from second place to grab the checkers while Banjo Duke also moved up a spot from third to move to the feature after surviving a late charge from Terry Cregger. On the start Bailes continued to show the speed he had for qualifying as he put a big gap over the second place driver. Hawkins made an early move to get by Almond for second but just three laps in his motor let go and his night and chance for doubling up was done. On the restart Almond was passed by Ryan Montgomery and Bailes was sailing away up front as he approached the rear of the field twelve laps in. On the seventeenth lap the caution flew for Logan Roberson slow down the back stretch and not being able to safely get to the pits. Bailes once again got a great restart but multiple cars behind him come together and the red flag is deployed for cleanup. Corey Almond and 2017 track champ Justin Williams get the worst of it and both were taken into ambulances to be checked on and one left the track [Editor’s Note: I think it was Almond but could not confirm]. On the next restart the red flag immediately comes out again as six cars come together and block the front straight. Once the racing resumed Bailes got back into his groove and Montgomery was trying his best to catch the leader but fell back about a straightaway from Ross. While all this s going on Tyler Bare, who started 20th, was charging his way through the field working his way up to fifth place with just a handful of laps remaining. Chris Ferguson did mount a late charge on the leader with a late race caution but Ross Bailes was just too strong and led flag to flag to become the 2017 Fastrak World Champion and take home that sweet $20,000 check. Breaking into the warm days of June, each race division has clearly established its leaders. Some have been red hot while some have struggled in recent weeks. With highly competitive points battles going on in each division, each week of racing, each position on the track will shape up just who will earn a 2017 track championship. This week’s racing was no exception as on the evening’s race card was the Trip Anderson Realtor Winged Champs. Followed by the Riverside Paper Pro Six’s in twin race events, Old Skool Video Games Super Streets, Bojangles Enduros. Trip Anderson Realtor Winged Champs 20 laps: Brandon Lorah was the afternoon’s fastest in qualifying for his second pole of the season. Sporting the pole lap set at 23.234 seconds, Aaron Leach lap which was just fifty-six thousandths off and worthy of the share of the front row. Race action was underway, so was the beating and banging as Aaron Leach lead lap one. But as lap two clicked, Brandon Lorah the pole sitter reclaimed the lead and began to set the pace. Several laps later, Lorah would lead the three-car tandem into the latter stages of the race when on the last lap. Scott Allen with a bump and run was able to knock the race line of the leader and beat Lorah to the stripe. Only nineteen-thousandths of a second was the difference in the photo finish. Scott Allen in Victory Lane, “Man you don’t know how nice it is to come to Langley and win. It’s a place I’ve always wanted to win at”. Justin Fuller lead the time trials with a lap at 17.291 seconds over an eight-car field in the Pro Six division. The hot wheel of Adam Florian who has so far dominated the division would start shotgun to the pole sitter. Green flag race action soon began and from the three spot on the grid, Bobby Hall quickly did away with Fuller to lead lap one of the event. From there it was on and building a ten car lead by the latter stages of the race was the race leader. Justin Fuller would give chase but the evening in the Pro Six division belonged to race winner Bobby Hall. From Victory Lane, “Yeah man we finally did it, this car had so many gremlins when we first got it”, explained Hall. “It’s a pleasure to race against the Florian’s, to finally, finally get him, it’s been a long time coming. I mean, we worked so hard the past two years after Langley closed down, we didn’t know what we were going to do. I just got to thank Bill for bringing this track back and giving me an opportunity to race”. In the second Pro Six race feature, the mandatory eight car invert was handed down giving Casey Sipe the pole and sending race one winner, Bobby Hall to the rear of the starting grid. The green flag would wave and on the move from the four spot was Travis Wall to take the race lead. After a few cautions in the early goings that knocked out the services of Bobby Hall and points leader Adam Florian. Travis Wall set sail while enjoying a lengthy race lead. But suddenly the lead collapsed as Casey Sipe with Justin Fuller would run down the leader. But with just a hand full of laps remaining, leader Travis Wall’s engine expired handing the lead to Casey Sipe. From there, Sipe would hold off the charge of Fuller and cross the stripe first for the race win. Casey Sipe from Victory Lane, “Appreciate my family for sticking in there with us, it’s been a rough couple of years, the year off when we didn’t have a track to come race. We by no means had a winning car tonight, the car was so bad in the first race I had to park it”, explained Sipe. We didn’t know if we fixed the problem so we elected to start in the rear. We’ve been down on speed all year and the car won’t rotate through the corners like the new cars, I’ll take a win any way I can get it”. Renno Marchetti IV had the fastest hot rod in qualifying with a lap set at 18.917 for his second pole of the season. Sammy Gaita was just a bit off the pole speed but fast enough to earn the two spot on the grid. Landon Abbott, Randy Akers, and Sean Calway rounded the five best in qualifying. The green flag waved and quickly the pole sitter wasted no time in securing the lead. Both Landon Abbott and Sammy Gaita would battle for second with Abbott earning the position. Meanwhile, Marchetti was getting away and in cruise mode in the early stages of the race. The race was halted by two cautions periods but it was the final one that race leader Renno Marchetti IV was money and would go flag to flag for his first race win of the season. Marchetti from Victory Lane, “We definitely got the car back tonight, I’m just thrilled to have it back the way it used to be”, says the race winner. “I really gotta thank Larry King Law’s Langley Speedway for giving us such a great place to race. Gotta thank Old Skool Video Games, thank you for being our division sponsor, thanks to all my fans for coming out and Happy Birthday to my sister Denise”. South Boston, VA – A strong field of national and state champions showed up for the spring opener at the historic South Boston Speedway for their 60th anniversary on a beautiful Saturday afternoon. By the time practice ended it was clear that the track record from 2007 would be broken by a large margin but what wasn’t clear is who would be breaking it. Qualifying rolled around and by the final group of drivers, the record had already been bested by nine cars. Philip Morris rolled out in the final group of cars and ran a 14.731 (prv. record 15.314)lap to claim the record over eleven other drivers. Bobby McCarty was the only other driver to get under 15 seconds with a 14.944. South Boston is continuing the passing points system this season but with a small revision, you have to drop back at least two places in the field. McCarty took advantage of this by dropping from second to fifth in the first race of the day. Morris had the car to beat all race long but second through fifth saw some great racing. From lap one to lap fifty Kelly Kingery, McCarty, Tyler Hughes, and Peyton Sellers traded positions routinely with clean passing. On lap 70 Kingery got knocked out as McCarty went for a pass and wrecked the 57 car. Sellers would also take damage from the incident that would lead to him falling through the pack as he had some tire rub issues. After sitting back much of the race Pulliam started to push through to the top-5, he would get up to third before a green-white-checkered restart where he fell to 6th position. Morris takes the win with Dominion Raceway champion finishing in second. McCarty finished third, Hughes took fourth, and Rev Racing driver Madeline Crane took 5th after some early race troubles. In the second hundred lapper Sellers hopped back into his main car after the damage to his backup car took in the first race. A ton of changes in the original starting lineup on top of the eight car invert made for an interesting start. Lee Pulliam ended up on the pole as Dean Ward put his son in the car. Thaxton led the first lap over Pulliam as the second line started to gain some grip. A big wreck involving five drivers, Pittman, Crane, Ward, Kingery, and Crews, happened on the second lap. On the restart, Thaxton goes low and Pulliam goes high after seeing what Thaxton did with it at the start. Behind him they go three wide for second with Smith able to pull off the pass and Thaxton would fall all the way back to eighth. A long green flag run rolled along with Morris eventually getting into the second place with Pulliam way out in front. On lap 49 as Lee lapped the ninth place car and had was almost a half lap ahead of second the RD decided a competition caution was needed. 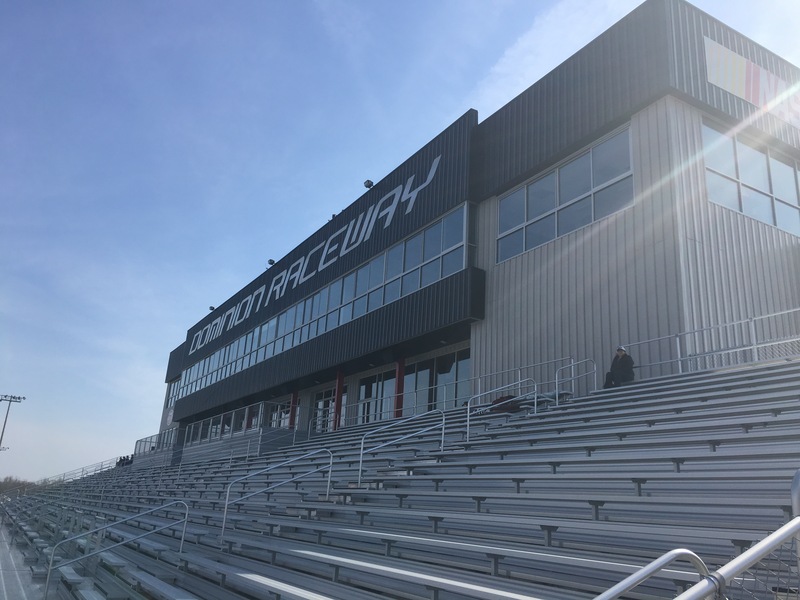 MOORESVILLE, NC — With the first race of the season in the books just two weekends ago competitors on the CARS Tour must quickly turn their cars and attention to a brand new track, one most have never seen, Dominion Raceway. Located 45 minutes due north of famed Richmond Int’l Raceway, the one year old facility is noted by many as the nicest short track facility on the Each Coast. The track features an onsite bar/grill, luxury suite boxes, and a full size live play video/scoring board for the fans. Competitors on the other hand will notice a smooth racing surface that will produce speeds like they won’t experience anywhere else this season and a racing groove that primarily takes place around the bottom of the 4/10 track. Fans and teams alike will see their second new format introduced by the CARS Tour this offseason. Teams will get two chances to earn championship points, and come away with a CARS Tour win, as duel 75 lap races for each division will keep fans and competitors at the edge of their seats, four races for the price of two. Just as the annual NCAA March Madness tournament heats up, so does the same for Super Late Model drivers this weekend at Dominion Raceway. Just like the conference tournaments around the country lead to automatic berths to the big dance, similar stakes are on the line in the duel format races. One Super Late Model driver will punch their automatic berth ticket and be locked in to the Short Track US Nationals at Bristol Motor Speedway on May 21st when the final checker flag waves Saturday afternoon. The berth will be awarded to the team with the highest average finish between the two duel 75 lap races. Should there be a tie, the tiebreaker will come down to the fastest average of the competitors two qualifying laps. Needless to say in addition to championship points and race wins; a lot is on the line at Dominion. Youngster Brandon Grosso has made the transition this season from the dirt modifieds he grew up racing around his home state of New Jersey to now piloting the #32 Nitro Fish Ultimate Gear Late Model Stock for Marty Snider Racing full time on the CARS Tour circuit. This weekend’s race at the super-fast Dominion Raceway will be as close to home as Grosso will get all season, with his hometown of Belle Meade, New Jersey being four and half hours away. Despite the closeness and fact that the two 75 lap duel races could play into his favor for a rather good outing, Grosso is business as usual seeing this as another opportunity to gain experience around at another fast asphalt oval. Much like the race tires drivers must conserve throughout the two duel races this Saturday afternoon; the River City QDMA is focused on conserving whitetail deer population around the Central Virginia area. Proper education, population management, and a continuing hunting heritage are all ways the River City QDMA uses to keep quality whitetail flourishing in the area. The key to success for any conservation is reaching the right people to hear your message; without question the River City QDMA and the grassroots fan the CARS Tour attracts are perfectly matched for such a partnership. For more information and to stay up with all the latest news and information about the CARS Tour, featuring both Late Model Stock Car and Super Late Model divisions, visit http://www.carsracingtour.com or contact the tour’s office directly at 704-662-9212. Stay social with the tour by “liking” the CARS Tour Facebook page and following along on Twitter @CARSTour. Thornburg, VA – It came down to a matter of inches in the inaugural K&N East Series event at the brand new Dominion Raceway. Spencer Davis, 17 of Dawsonville Georgia, held off Justin Haley in what looked to be an instant replay of Phoenix earlier this year on the cup level. In what has to be one of the closest finishes in K&N East Pro Series history, Spencer Davis was able to hold off a very hard charging Justin Haley and cross the finish line a mere .005 second ahead of Haley in a thrilling photo finish. Davis, who qualified third earlier in the afternoon, spent most of the time running second to teammate Kyle Benjamin who lost the lead on a late race restart after being involved in an incident, much like the restart at Dover, that collected a few other cars. “My teammate certainly was the class of the field and had the car to beat,” Davis said in victory lane after the race. “He didn’t do a single thing wrong all night and was the car to beat till he got put out. My first reaction when I saw him get bent out of shape and pushed from behind and into the wall was, wow this is really unfortunate for our team. Then it set in; I need to win this for us. Ranier racing needs to get their first win and I need to get my first win so what its going to take I was going to do it.” Davis, of course referring to Benjamin being parked by NASCAR officials, after multiple altercations with Dillon Bassett under yellow flag conditions. Bassett, who was actually just going to be held for one lap, was also parked as he continued the “vehicular conversation” on the racing surface as well. Justin Haley, who entered Monday’s race tied with Benjamin for the points lead, did not make things easy for the Rookie as the two came to the stripe and the checkered flag. The young driver actually didn’t make things to easy on himself either after qualifying eleventh out of twenty-four cars. However, he was able to work himself through the field as the race went on and got a lot of help from that late race caution mentioned before took Benjamin out of the running. Haley ran him for everything he had coming out of turn four just came up inches short at the line. The time it took for NASCAR to announce the winner might as well been an eternity for both drivers, who both sat on the front stretch looking at each other waiting for the call to be made. Davis told us it was the most excruciating thing ever having to sit there in the car with the announcer going over the race and watching the replay on the big screen. Davis also told us however; once you hear your name come over that intercom and they announce you as the winner it is just the best thing ever. Noah Gragson, Kaz Grala and Austin Theriault would round out the top five finishers after 150 laps at Dominion Speedway. The ComServe Wireless 150 will be replayed on NDCSN this Thursday, June 2 at 6 p.m. EDT. The series will head up to north to Stafford Springs, Connecticut for the Stafford 150 on June 17th. 6 6 Ruben Garcia Jr.
12 42 Jairo Avila Jr.
19 43 Ronnie Bassett Jr.